You must have noticed that when you try to open “Google.com“, you are being redirected to a country specific page of Google i.e. Google redirects to the specific URL [Either it be Google.co.in for Indian Users, Google.co.uk for users in United Kingdom or Google.com.ph for users in philippines] according to the location from where the user is browsing currently. But why this redirection? Why not just open Google.com? But I believe that to avoid negetive affect on the way you google for your needs and to obtain more specific, more general and generic results, it’s important that you surf using Google.com. But how do you do it? It’s pretty simple. There are 2 ways to do it. If you are redirected to the country specific Google webpage then find for “Google.com” on the right hand corner at the bottom as shown in the screenshot. Click on it and you will see Google.com in the address bar. 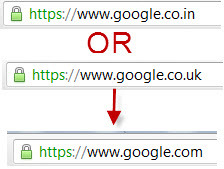 Instead of trying to open Google.com, in the address bar type “http://www.google.com/ncr” as shown below in the screenshot. This is a one time process after which you not have to keep repeating this step every time you are willing to opt for Google.com. Here NCR stands for “No Country Redirection”. Opening Google – [No Country Redirection] makes sure you are prevented from being redirected to the country specific URL. This is done by installing a cookie that makes sure that country specific search results are prevented and the standard results are shown. This installation of Cookie is done internally hence you won’t have to bother about it. You will be able to access Google.com using this technique until and unless you clear or delete your cookies. Some users who are using an outdated versions of browsers might not be able to use the Second way of opening Google.com hence it’s recommended that you upgrade your browser or opt for the First way.